FastKidz Racing, a family of racers was established in 2012 back in Yucaipa, CA. Mikaela McGuire at the age of 11 wanted to express her racing genes and follow in her father’s footsteps. Mikaela’s father Mark McGuire Sr., a long time asphalt circle track stock car driver decided to hang up his racing hat and focus on his children’s racing. Their neighbor had an old NHRA Jr. Dragster in his garage. As Mark’s wife Melissa shuttered at the thought of her 11 year old daughter being strapped into a dragster and being hurled down a quarter mile track up to as much as 85 miles per hour Mark Sr. could not wait to see what his spunky little daughter had in store for them. Mikaela soon showed him that she had what it takes to be a drag racer. In her first trip down the track at California Speedway in Fontana, CA little 11 year old Mikaela showed everyone she was in no way scared of speed. She flew down the entire track on her first run and never looked back. Mikaela went on to gain the attention of Chris McGee, a widely known NHRA JR. Dragster engine builder. McGee proudly helped Mikaela weave through the Jr. Dragster world. At the same time Mikaela joined the NHRA world, her older brother, Mark McGuire “Marko” befriended a local Go Kart Racing Champion. Tristen O’rear was a World Formula National Champion and, like Marko he was very tall for his age. Tristen offered one of his Championship go karts with an engine to Marko to see if he liked karting. The love for Karting began. Mark started his racing career at California Speedway. He soon became one that everyone was watching as he was very smooth and fast. Marko quickly earned his first Championship in the World Formula Jr. class at the age of 13. FastKidz Racing was born. It became very apparent that Mark and Mikaela McGuire had their daddy’s racing genes. As a family the McGuire’s decided to move to Kansas City Missouri where they could continue their love for racing. Mikaela soon discovered that the NHRA world out in Kansas City was not for her. She fell in love with the local karting association that her brother was racing at. Marko and Mikaela joined Kansas City Karting Association in Liberty Missouri. Marko earned his first championship with KC Karting Association in 2013 as the Clone Jr. Champion. He moved up into the Clone Sr. class and with a good solid base under his belt decided to compete in the TaG Sr. Class at the same time. Mikaela quickly learned and fell in love with karting. She worked hard and earned her first championship in the Clone Jr. class. There were many times that brother and sister were on the track together and it would always bring attention to the brother and sister duel that ensued. Both Mark and Mikaela developed great relationships with the other younger kids that were racing with KCKA. Marko took it upon his self to take any extra time he had to talk with the kids, give them tips on how to improve their lines and how to be a good sportsman when their friends do better than themselves. The kids of KCKA have looked up to Marko as a mentor and frequently come to him whenever they have any challenges or need to find that extra tenth or hundredth of a second on their lap time. Marko and Mikaela both started in the TaG class in 2014. Marko won his first Championship point series in the TaG Sr. Division in 2014 and Mikaela won the 2014 TaG Jr. Championship. Both Marko and Mikaela decided to broaden their horizons in 2015 and take on the challenge of Enduro racing with the KART MARRS Enduro Road Race Series. 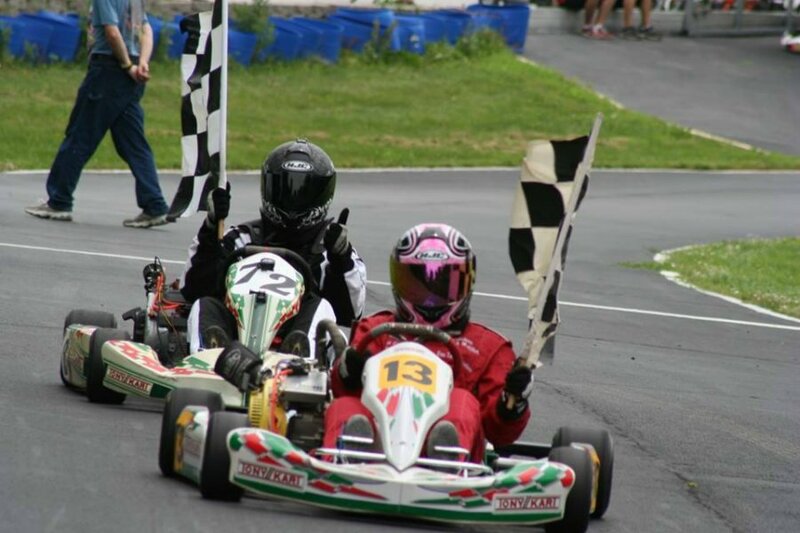 With their new Parolin chassis both kids raced to a very successful season. Marko had stiff competition with the veterans of the TaG Sr. class and Mikaela being the youngest in the class at 16 years old had her hands full. Mikaela struggled the first couple races just getting adjusted to the increased speeds and handling. Marko got his first win of the series in Hastings, NE and Mikaela edged out her brother to take the first very exciting win in Lake Afton, KS. At the end of the 2015 Season FastKidz Racing headed to Kentucky for the WKA/KART MARRS Fall Nationals. Mark had an amazing weekend bringing home the win on Sunday in the TaG Sr. division and the KART MARRS 2015 Season Championships in the TaG Sr. 1 and TaG Sr. 2 division. Mikaela finished 3rd in both the TaG Sr. 1 and 2, in front of many talented and seasoned racers. Many more race seasons and championships are in store for Fast KidzRacing. 2016 Fast Kidz Racing will be running Marko in the Tag Sr. class again and will be joining the Shifter Kart world as well. Mikaela will again run the TaG Sr. Division, seeking to beat her bother and bring home another championship for the Fast KidzRacing team. Follow the Fast KidzRacing journey at www.fastkidzracing.com.